Yesterday I had " the pleasure " courtesy of two free tickets to watch next week's cup opponents, Sheffield United, take on the MK Dons. It was far from a good game and matters weren't improved by the Dons having one Izale McLeod in their ranks. I can confirm he remains as awful as he ever was and never threatened the Blades' goal. His best efforts were as a ballboy when he retrieved the ball in an attempt to speed things up. Did we really pay £1 million for him ? It was difficult to say too much about United as the Dons were so poor and carried such little threat. I note that Clough felt this was his side's best performance of the season, they must have had a worse one than even us then if that's the case. They eventually ran out 1-0 winners following a first half goal from Scougall. 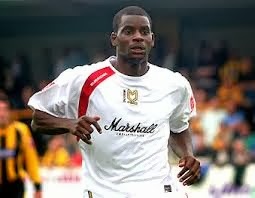 It was a nice run and finish for the goal although in truth the Dons defenders didn't seem to keen to try and stop him. Ex-Toffee Jose Baxter remains a decent player and had a few good efforts. Jose frequently got annoyed with some of his team-mates who weren't on the same wavelength. The Blades lost three players to injuries during the game with two in the first half. Brayford and Murphy who both need scans in the week. Chris Porter came on to play upfront just before half time with Baxter dropping back to midfield. Porter is the sort of player who would drive you mad. He lacks pace and from what I saw yesterday wasn't too keen on doing a lot of, if any running. He like McLeod carried no threat yesterday. This was United's seventh win in a row in all competitions and must give them some confidence. However, United are not a big physical team and I saw little to be overly concerned about as long as we play half decent. Elsewhere the Addicks lost as expected to champions elect, Leicester City. It sounds like a disappointing effort from our boys and that we played without fight and spirit in total contrast to the previous two matches. Thankfully Hamer was given the nod over Thuram and played his part in keeping the score down to 3. The injury to Morrison is a worry and one hopes that he is fully recovered by next weekend. Hopefully we'll get some players in to boost the squad for the onslaught that lies ahead. I'll not be holding my breath on that one though ! Our boys have the full week to prepare for Sunday's quarter final, the last time this season that we won't be facing at least one midweek game. The Blades are at home to Peterborough on Tuesday in what is an important game for them. I assume Chris will be up there to see that one unless he wants to send me on another scouting mission for him. I'm quite excited and looking forward to next Sunday. I'll happily wish the week away. Roll on next Saturday when the pre-match festivities will begin !